The study of the quantum field today has, since Max Planck’s first discoveries in 1904, thrown up a plethora of new insights, much of which have been puzzling scientists as it was often shaking up the known paradigms of academic science. Other discoveries have, for a number of reasons, been kept in the bottom drawers, so not to see the light of day in any of the mainstream science documentaries often not to disturb the status quo of vested interests. The material is explosive and capable of changing our world as we have come to know it. In Mr. Gores’ words an ‘inconvenient truth’ is about to manifest amongst us without having to be forced into view. The public at large will simply vote with their feet when they see the advantages of less money to be paid to the energy barons and their cotery. Over two hundred years of reductionist science that allowed for these restrictions to be in place is coming to an end as the amazing truth is appearing underneath the layers of lies and deceptions the business of officialdom in science has morphed into. Since the the photon double slit experiments revealed that the results always corresponded to the questions a researcher asked, we know that the outcome of any experiment can be massively influenced. Churchill was famously known to have uttered the line ”I only trust a statistic that I have falsified myself”….This underscores the influences of forces that have long coerced and hijacked the freedom of the scientific process. Today we are to believe that climate change is a big problem and carbon dioxide is to blame for it. The Papacy is about to deliver an encyclical document that is all in favour of drastically reducing the world population on the basis of excessive man made climate change. It, thus, all has become a matter of faith and straight laced science appears to have increasingly become an irritant to the proponents of the corporate politics that have long since prostituted science to their own nefarious ends. The discovery of the quantum field and it’s immense potentials will furnish a return to a state where the scientific process is free to investigate and explore again. Crowd funding I Austria for the Rosh Generator has shown that it works. (See: top 5 exotic free energy devices I the resources section) To re-instate the freedom of scientific research is the first step on the long road back to reclaim sanity in an open minded forum that is able to promote abundance rather than the well trodden path of scarcity. The human community was graced with men like Tesla over one hundred years ago who demonstrated technology that operated outside the box of conventional thinking and clearly showed that being harnessed to the cart of fossil fuels as the only source for energy generation is a fallacy. Viktor Schauberger came along and demonstrated to mankind that a suction process inside water vortises was by magnitudes more powerful than the combustion process based on explosive and wildly polluting mechanisms. Despite these pioneers amongst us, the entire 20th century remained one big story based on explosive processes in civilian life and warfare. This always leads to scarcity which is easier to control by a psychopathic mind set than making arrangements within a set of conditions based on natural abundance. 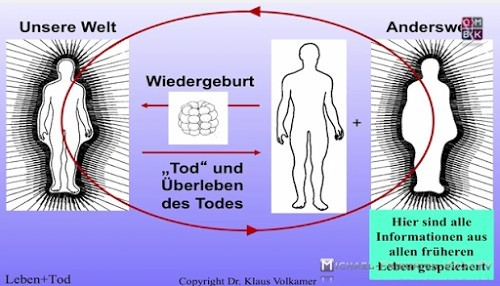 Natural abundance is intricately linked up with the quantum field as is elaborated by Dr. Volkamer and M.T. Keshe alike. There is ample proof of this in the list of practical applications at the end of this article. All the links there are in one way or another connected to hitherto unknown effects and merit further study and research. What is also exciting about this is that the reader is also placed in a position to understand that he becomes an active participant in promoting this work as he becomes part of an open source investigation, that is based on crowds of people sharing their insights. The Ubuntu movement is one example of this new thinking. Einstein had real problems integrating anomalies with phenomena in space that occurred faster than speed of light. The ether is full of these phenomena and the double slit experiment threw up some hints but the explanations was forced on the basis of cutting edge conventional physics, and thus, that door remained shut until our current period in scientific exploration. Gravitational experiments since Hauschka and Volkamer today scientifically demonstrated the existence of such ‘ether’ or quantum fields on a sound basis as results were obtained with highly sophisticated detection equipment. However, it was also found that a person merely walking by along the corridor outside the laboratory could alter the results of the experiments since all the quantum fields carried by people and machinery mutually influence each other. This is just to demonstrate how fragile the business of breaking away from the rule book of thermodynamics is in reality. Not so, however, in the field of practical applications, though, as will be shown later. Thomas Kuhn argued in his book ‘The structure of scientific revolution’ that breakthroughs in science, although they are sciences’ bread and butter activity, do not progress simply by accumulation of data as ‘normal science’. It requires a paradigm shift in connecting the conventional physics and chemistry with that of the quantum field which would bring back together all the supposed ‘anomalies’ that have over the years been carefully edited out of normal science. The beneficial changes of this shift would register in areas such as physics, chemistry, medicine, food production, energy generation, and more, just to name a few. (See links to follow at the bottom of this article) . Sadly, many inventors who came up with trail blazing ideas outside the conventional box often ended up risking their entire careers in academia, since the scholarly way often follows the preservation of the status quo of ‘normal science’. Remarkably, in 1920 Einstein offered his student audience at Leyden University the idea that the concept of a space-time dimensionality was not possible without the idea of ‘ether’ as the arena enfolding these dimensions. So, even one of the much touted 20th century geniuses broke a taboo in the name of science, albeit proof eluded him, much as he tried. He was too stuck within the box of his own limitations of concepts of relativity as will become clear further along in this article. In his experiments with subtle matter and energy Dr. Volkamer experienced that the mere contact of an observer by touch or even a strong glance at the experimental setup could nullify all the quantitative changes of the experiment. No wonder, the reality of this field is so hotly disputed to this day. Despite the fragility of experiments with subtle matter since the discovery of the Planck bodies over 110 years ago, many new ideas, technologies and practical applications have been generated for use and the benefit of humanity. We have reached a stage where many technical applications are reaching to the market often unbeknown to a wider audience. The stages of silencing or ridiculing this, however, have long been passed. How the various fields interact and what properties they bring onto the reaction as well as it’s practical applications are, therefore, the subject and topic of this last article. An astute observer of the scene will have noticed that of late hardly a week goes by without a new energy generating system appearing on the scene. The pace seems to have accelerated since the beginning of 2015 where at least half a dozen of such devices are getting ready for market with hundreds of units being ordered and sold. The Rosch Generator, is one of the most recent designs that operates on principles of over unity, which cannot be fully explained by conventional scientific standards. Only the inclusion of the quantum field is capable of allowing for some logical explanation of this wheel work of nature. It is interesting to note that the Rosch generator is based on an Austrian crowd funding intitiative. Invisible: It cannot be seen with our eyes, but people with clairvoyant abilites can see it. It ranges outside the spectrum of refarcted visible light or coarse matter. Visible: This represents what we can see, touch, weigh and chemically transform from oneaggregate state into another such as a spark that transforms solid fuel into ashes. the quanta have macrocopic mass and are large. Orbs of light on Digital photgraphs for instance. The quantum fields can be weighed as they have been absorbed into the galvanised silver orbs. Dr. Volkamer noticed that they vanish at an instance as soon as one touches the objects or even looks at them with intent…. The components of an atomic element and it’s electrons with a discrete location for it’s infinitesimal structural components. According to Einstein’s special theory of relativety (STR , 1905) matter and energy would be described as a phenomenon of space, but was not recognized so far. Note: The Minkowski diagram left a blank space in this position which is currently being filled up by many new observations. Einstein’s special theory of relativety (STR) describes this matter as a phenomenon of time. This has found to be reversible with untold potential that is opening a vast field of research for large scale industrial applications today. The magic plug into the weelwork of nature and the ‘free energy ‘ debate. Even antigravity effects are possible, see for instance the Hutchison experiments and those of Profs. Kostantin Meyl and Klaus Turtur. Follows the second law of thermodynamics in an irreversible process. However, when combined with the quantum field it becomes, definitely possible to recombine CO2 and water to make diesel fuel again. Thus, we do not need any carbon capture storage solutions underground since this is now possible. The CERN journal writes now that these particles do not comply to the laws as known from the periodic table. The search for the ‘god particle’, whether the Higgs Boson or otherwise, reveals itself to be a vast waste of money (4 billion Euros construction costs) , since smashing up particles in the Hadron collider will, according to Dr. Volkamer (2003), never open the vista into the 96% of the dark matter/energy quantum field. When approaching the big bang in an experiment like this one can only use equipment that is absolutely still. Even looking at the experiment can send out a subtle energy beam from ones eyes, as described by Plato, and distort the result. Luckily, the computer software had recorded these results beforehand. Even directing ones hands toward the experiment can change the weight as they too emit a subtle energy beam. CERN’s Hadron collider is built on the sole assumption that the elements of the periodic table exclusively form the foundation to their multi billion research effort. All strucutral components are desgined and laid out to just detect any of these resepective changes during the experiments. The quantum field is penetrating through all it’s strucutral componetns in any case and can lead to false positives too. However, as their mindset is not ready to fully accept it’s implications of their own published discoveries they are still captives of the thought that spending billions on smashing elements in a collider will one day reveal the answers hidden behind this veil. This is as absurd an undertaking as if a biologist were to smash living cells into each other in oder to study and understand what makes them work and where life comes from. 30 years of research by Dr. Volkamer revealed that this is the subtle material and energy consciousness itself is made of. The space-time association brings forth a living cosmic entity. This is the living matrix that is watching over everything and also known as the akashic record for instance….It is entirley based on non-electromagnetic phenomena to which the workings of our brains can be finte tuned to. The cental nervous system is one of the strongest detectors we have and capable of this feat. The legacy and collected wisdom of old cultures, whether from a Chinese background, the vedic tradition or Egyptian high culture, all show that they had incorportated the the faculty of a highly refined intuition. To a certain extent it makes one also aware why degenerative processes set in to make these high achievments fade away, since a lack of encouragement and practise makes these properties vanish again. What sounds esoteric is simply an extension of the laws of physics. Everything is alive, even minerals contain these consciousness fields of the universe. Bubbling water in moutain springs are full of this subtle energy whereas the water in a sewer is lacking it to an extent that can duy be called dead. It is intereting that vortexing it in specially designed vessels can revive it. waking consciousness blocks people to such an extent that they can just about register electomagentic signals. This freezes a person into a state of the 4% matter space-time frame focusing just on the tip of the iceberg from their vantage point on a boat by the name of ‘The mental Titanic’. Humans (knowingly or unknowingly) are made to participate in and carry these fields of consciousness (quantum fields). It is their choice to experience this consciously. The energy leaves our body at the point of death, but remains an alive quatum field looking for another vehicle to extend it’s range of experience and so on and so forth. A somewhat limited view as a consequence of placing the entropic process at the centre of the raison d’etre for all materialisations and life itself. It thus, represents an artificial separation between the 4% of matter as we have come to know and the interlocking 96% of the quantum field. It discounts the idea of all materialisations from energy. This is the legacy of the postulate that only quantitative measurements are representative of reality. Does the soul have weight? When conducting research on sleeping bodies it was found that the weight changed up to a pound and a half during sleep phases, day or night. The body became lighter by ounces and pounds as a phenomena took place that cannot be explained alone by the loss of water and other metabolic processes. As soon as the subjects woke up the original weight was immediatley restored. This reminds us of the mysterious influences of the obeserver and the experiment nullifying any changes when touching the vessels as explained above. This was already observed in Chicago during the 1920’s where a researcher weighed the bodies of TB patients just before and after death set in. This led to the famous question often tossed around in dinnerparty conversation ‘what is the weight of a soul?’ Weight changes on a coarser level can be observed when rechargeable batteries are put on a scale before and after recharging. I repeatedly observed weight gains of more than 10% in AA batteries. In a sleeping body, however, it is speculated that the energy body or soul is actually uncoupling itself from the physical body and connects itself to the quantum field for it’s own recharge. The act of dreaming often compensates the sleeper during these necessary stages of vital recovery. People with a a prolonged period of stress and disturbed sleep often lose their vital resistance, their immune system caves in and, in consequence, they fall ill after a while of exposure. The phenomena relating to the quantum fields are found throughout the universe. This will upset quite a few dearly held and cherisched theories about evolution and it’s spin offs such as tectonic plate shifts. The subduction theory of the plates and resulting formation of mountain ranges will, in time, become as obsolete as the theory of evolution itself as elaborated by the scholars who follow Darwins assumptions. None of this will have much legroom to stand on. Dr. Volkamer offers this explanation. The odds that a single protein forms from the primordial soup by way of amino acisd and gases acting together under the influences of lightning discharges has been calcualted as 1/10th to the power of 27million. Our universe has been calculated to be made up of atoms that number 10 to the power of 80 and the weight is 10 to a power of 53kg…..So the chance that a single protein could have randomly formed by these incidental forces acting on each other is so infinitesimal small that it is astonishing we have leading academic theories the world over riding on this premise. The University of Saarbruecken, Germany, conducted Reserach by which they tried to establish the metabolic rate of a human body. They took the established base line that a human body consumes 2000-2500 calories per day but it’s output in heat and muscle activity amounted to an equivalent of 25 000 calories per day. 9/10th of our energy requirements are not accounted for! This huge gap only allows for one explanation and that is that we are well advised to study the interactions of the quantum field, sunlight and other cosmic influences on our living organisms to understand the real deal. To reiterate man constructed a periodic table, that we now know comprises a mere 4% of all matter we know with 96% invisible dark matter of the universe comprising the quantum field by many names. This is probabaly one of the most revolutionary statements of our time because the vital force is back, alchemy is back, holistic medicine is back and many more. All of these are now awaiting a sound scientific basis fit for the 21st century. Chinese medicine holds a doctrine that states everyhing in the Universe is Qi and then condenses or aggregates to become visible matter. As dated as it may sound to many at the same time it could not have been more to the point right at the cutting edge for the next evolutionary step in the scientific process of the 21st century. This is the very reason why so many areas are enveloped by this paradigmatic shift in sciences,including all manifestations from the simple cell to the complexity of a human body to it’s environment, it’s food sources, and everything we can see, taste, touch, hear or smell, indeed, the vety fabric of life itself as we know it. In short, it encompasses the animate as well as the inanimate world we experience around us too. Every rock , every tree, every flower, every lake or river have contain this life force which brings to mind a short poem by William Blake about infinity and eternity and the quantum field. Moving line by line from top left to bottom right with arrows indicating the interrelationship between man and other loci of organic influences and interactions. Life/death influencing the body field to the right with the deceased at the bottom connecting to spiritual beings/entities. 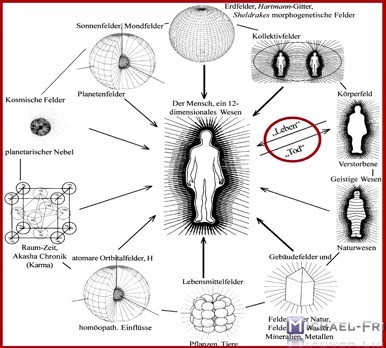 In the third row from the top appears the cube of space/time and it’s link into cosmic nebulae connected to the atomic orbital fields (electrons) These, in turn, are connected to Homoeopathic medicine and other energy mdicine and healing effects/systems. At the foot of the diagram are situated the influencs of the food fields from plants and animals. Finally, in lower right hand corner of the diagram are the infleuces from buildings and dwellings , which are also conencted to natural entities. The ‘Other world’ sits to the right and shows that all information of all previous lifes are stored at this location. So the saying ”watch out for what you wish for” could have more than just a metaphorical ring viewed with the eyes of quantum physics. The cycle of red arrows within the diagram represents the cycle of real experience of a human to absorb, refine and accumulate cosmic consciuosness on a vast scale. Many spiritual and religious traditions throughout the existence of mankind have already poijted to it’s presence. Perhaps another and more positive meaning to the symbolism of the all seeing eye from the Egyptian store of symbols. The field is so vast and extensive that throughout history members of the human species repeatedly came up with elaborate schemes to obfuscate, obscure and undermine these realisations, for whatever self serving and nefarious reasons it may have been. Did I hear someone shout it has all to do with material gain and unfettered greed? Be that as it may, but we are at an unprecedented threshold in history now with the tides turning so strongly that the clocks of positive developments cannot be turned back any more with whatever artificial means nefarious man may come up with. Many people are now stirring from slumber whilst quite a few have woken up with the momentum gathering pace despite a corporqte media trying to stop it. But it becomes ever easier to call the bluff since 9/11 was a clarion call that caused so many questions to be asked that none of the officela versions could ever satisfactorily settle. We should not forget that our responsible leaders have triggered a number of wars on the back of it. Since Nicola Teslas’ days and the discoveries of Max Planck and other researchers in quantum physics this big story has been dormant for over 105 years like an elephant in the room of modern society and the time has come to meet and greet it. So, this leads us back to headlines in the press that tell us about Audi making diesel fuel from water, the Steorn company of Ireland presenting a ‘cube’ for recharging electronic appplications, Iphones and I pads and such like with itself never requiring a recharge. We hear about and test run fuel saver devices that save 12-15% of fuel without any special adaptations to the engines of our cars. We learn about effective microorganisms in agriculture that could at the stroke of a pen, according to Prof. Dr. Higa make an abundance of food for more than double the number of people on this planet. The microorganisms have sensationally demonstrated a capability of reducing nuclear radiation from Fukushima to zero levels in organic fruit grown close to the stricken plants. The list goes on to cover medicine, and literally alll other areas of our life where the potentials have quietly grown and expaneded exponentially for quite a while now. We are definitely looking at the legendary ‘win win’ situation, as long as we keep our hearts and minds open with a firm mind corageously looking in this direction. The future starts righ here, get on board starship earth and join in the dance of life as it does not need much to behold infinity. Researchers in the field of “energy medicine“ have recognized for many years that human health anddisease are influenced by factors that go beyond the material structure and function of the human body. However, no satisfactory causal explanation for such factors that transcend the level of the visible body has been given. New research into “subtle matter“ solves this contradiction and provides a causal explanation for “energy medicine“, “Integrated Medicine“ or other kinds of “complementary medicine“. Special detectors using sensitive balances have indicated the existence of a form of non-visible matter. This scientifically so-far unknown type of matter exhibits real macroscopic mass, energy and information content. The significance of the following described properties of this subtle matter is far reaching because the measurement method used is on the one hand fully anchored in the existing methods of experimentation of physics, while the results obtained go on the other hand far beyond the borders of the contemporary scientific paradigm. Facts on and solutions for nuclear radiation, geoengineering pollutants, and more. Prof. Higa estimates that enough food production for 10 billion people is possible with the use of EM Technology™ on world-wide basis. Actually, there are numerous reported examples of abundant harvests and unprecedented multiple crops for a wide range of products with the use of EM Technology™. He insisted from the start that even greening deserts was possible with the application of EM Technology™. His theory is now validated by successful cases of desert-greening in Egypt and Saudi Arabia. “The world is currently facing a time of great change and upheaval”, says Prof. Higa. “I believe this condition has arisen mainly because of our present civilization becoming increasingly structured along the lines of competitive principles. An excessive reliance on competition certainly does not excite feelings of generosity and sharing.“(Teruo Higa, 1996). One of the most fundamental beliefs in his philosophy is ‘creating a society based on co-existence and co-prosperity’. This page is devoted to featuring the top five exotic technologies that we know of that are closest to market. Here at PESWiki we cover the entire spectrum of clean energy technologies, from conventional methods such as solar, wind, geothermal, tide, wave, river on the one hand; to very unconventional or “exotic” technologies such as cold fusion, magnet motors, overunity electromagnetic motors, gravity motors, and vortex technologies on the other. There are many ways to harness the wheelwork of nature — energy sources that the environment provides free for the taking — that are not only clean but inexhaustible and ubiquitous. Conventional renewable energy (there are 25 genres) has made great strides but has limitations. We are tracking some exotic modalities (there are 25 of those, as well) — that science has not yet acknowledged as legitimate — that are making great strides toward being proven and preparing for marketplace introduction.